When designing a Passive House, we use the Passive House Planning Package (PHPP) to model the energy performance of the project. The PHPP considers two different design days: clear/cold and overcast/mild. Ottawa winter days follow these patterns very consistently. Yesterday was a prime example of a clear/cold day. As I mentioned in the last post, our heater shut off for 11.5 hrs during the day, even though the temperature outside never got above -12˚C. Here is the chart of yesterday's temperatures. 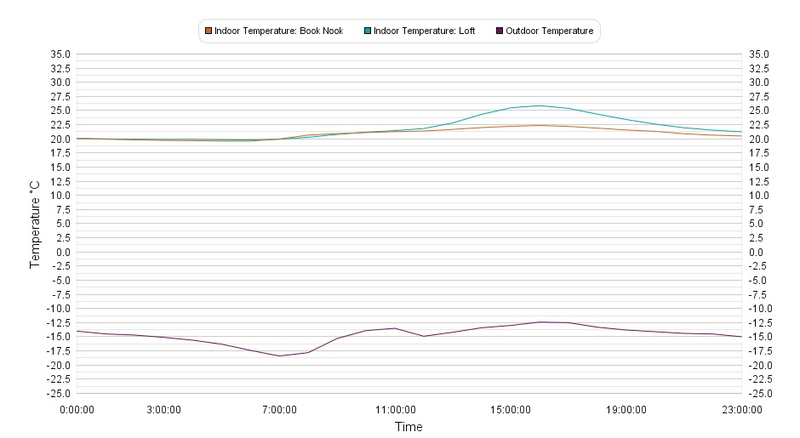 There are 2 indoor temperatures being monitored: the Book Nook is on the east side of the house outside of the master bedroom, and the Loft is on the top floor of the house. 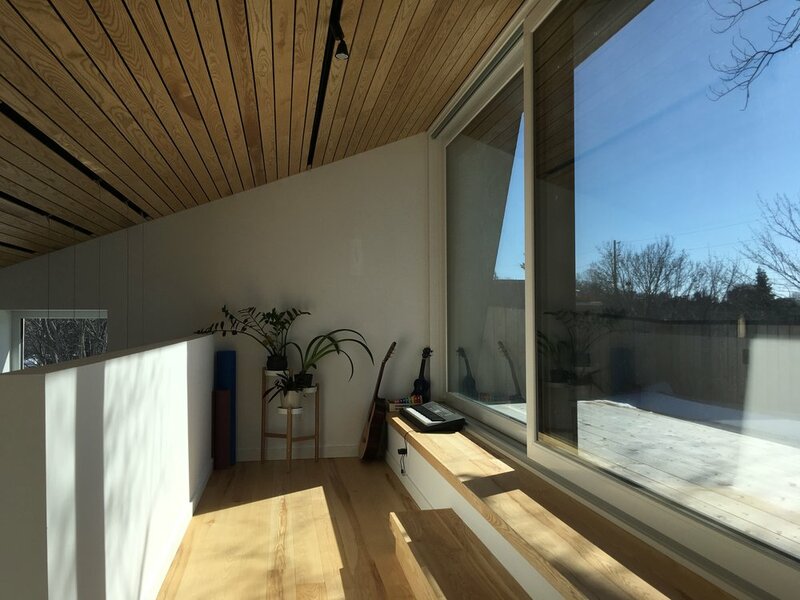 You can see that the temperature in the loft starts to rise noticeably as the sun gets around to the West, and starts to come in through the large lift-and-slide door in the loft. And here is the electricity consumption (downloaded hourly from Hydro Ottawa's website). You can see the drop at 9am and the ride at about 9pm — this is the 4kW heater turning off then back on. It's interesting to notice how, even as the heater shuts off at 9am, the temperature in the house climbs steadily from 7am through to about 4pm! Our brief flirt with spring weather has ended (for now). This morning we woke up to -18 on the thermometer, and it's been below -14C all day (it's 2pm as I right this). Our "furnace" (the 4kW duct heater that heats our home) turned itself off at 9am, and has been off ever since. That's 5 hours at -14C or colder without any heat on! What's more, the temperature has been slowly climbing all day thanks to the sunny weather—it was 20C when the heater stopped, and its 22C now. I'll comment later to let you know what time tonight the heater comes back on.